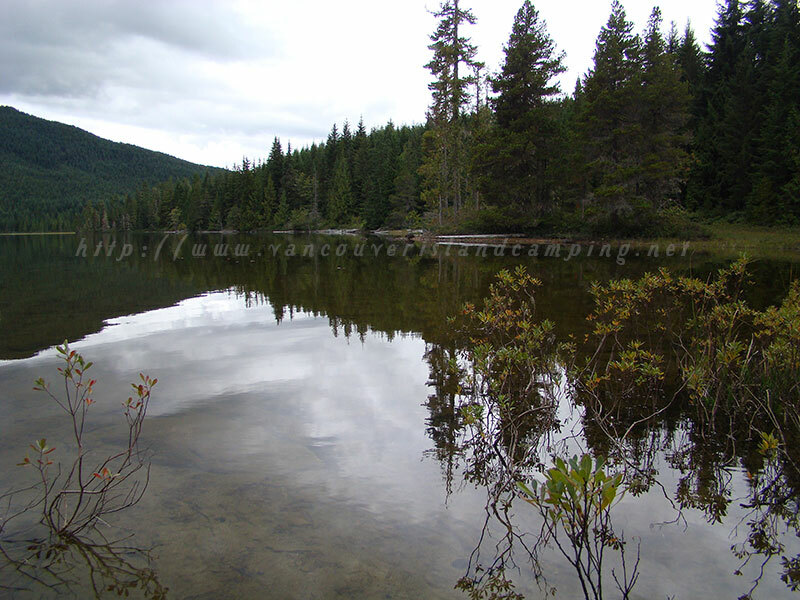 There is also an Upper Klaklakama Lake but it has no road access other than pulling over alongside the Nimpkish Mainline at a small pullout for one vehicle. It is too bad that WFP didn’t create a small campsite on the Upper Klaklakama Lake also as it has some depth to it and holds trout as I’ve witnessed them surfacing myself. Once you turn at the Mount Cain turnoff you cross over the Davie River Bridge and head south for about 3 km where you will turn left and go another 2 km. There you will see a sign on the left side of the road telling you the campsite is just ahead on your right. Use the form below to find out how to get to Klaklakama Lakes using Google Maps. This campsite has only 5 sites and two pit toilets but can hold more than 5 campers as 3 of the sites are relatively large especially the one on the beach. Old large truck drums are used for fire rings and there are two natural gravel spots close to each other where you could launch a boat. This is the site I chose to stay at because the upper campsite was reserved for an ecological study by university students and I decided to drive to the lower campsite and set up camp. I didn’t feel like camping for one night and having to move when they arrived. I was coming from Gold River and it is about 1 hour and 15 minutes doing roughly 50 km per hour. The road was okay but a little rougher than the weekend before when I traveled over it. Still all in all it was better than I’ve seen it in years. Seeing how it is a gravel road you should always take your time because of the sharp rocks and grader blade slivers that hide in the surface of the road. I did stop at the upper campsite to shoot some video footage to add to the lower campsite footage and noticed that there were also about 5 campsites with lots of room to share so the site could hold roughly 10 campers or more. There were a few picnic tables that were in rough shape but not as rough as the pit toilets which were in dire need of some repair. Fire rings again were made from logging truck drums. One site has access to the lake via a trail with what looks like a locally made hand rail leading out to a bit of a dock built out of a fallen tree near the water’s edge. There is a natural boat ramp between two of the sites. This is a very pretty site and while I was there I met a couple of campers from Nanaimo, BC in a pickup camper with a quad on a trailer and also a motor home towing a jeep. They had been there a couple of days and were just leaving due to the signs posting the reservations for the university study. We chatted for over an hour then they left. Before they left they told me of a road back towards the way I came (Gold River) that leads up the mountain where you can see the whole lake and valley. Apparently it is a sight to behold and I wish I had the time to go there but maybe next time. I finished up with my video footage and headed for the other end of the lake where I would stay for a day before heading to Anutz Lake and Little Huson Caves. When I arrived there was no one there so I had my choice of sites and I chose the one by the beach as there was a whole lot of firewood already cut and the picnic table was better looking than the others. 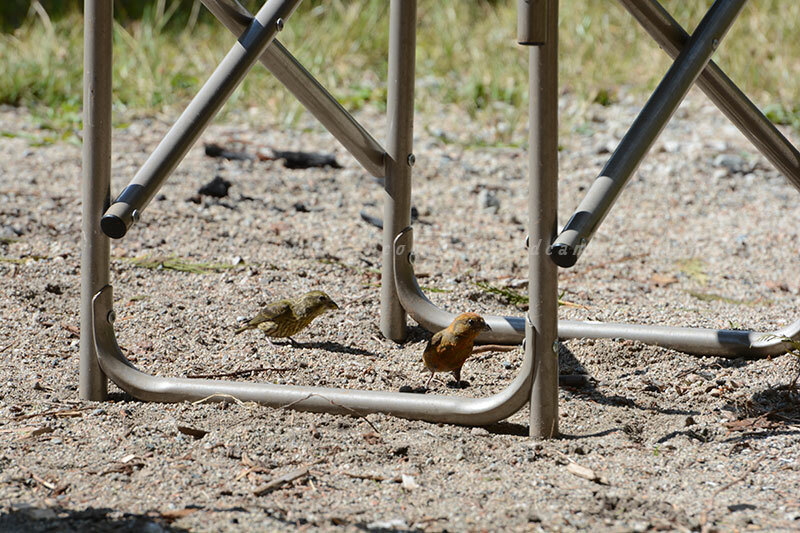 As soon as I got my camper level and started to chop some firewood I was visited by some very interesting birds that made a hovering sound with their wings instead of the normal flapping sound you would normally hear a small bird make. 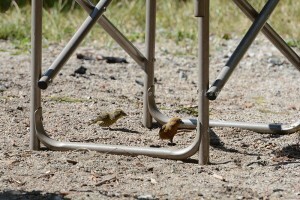 They were very used to human interaction as they would walk within a few feet of me while I was sitting in my Coleman chair. Not sure what they were eating but I assume it was an insect of some type. There is also a loon that was calling out across the lake and towards the evening it started circumventing the shoreline in search of fish I presume. Never got close enough for a good photograph but the experience was a fond one just the same. Also a little later on a family of Merganzers were also trolling the shoreline looking for food. As I had seen a lot of fresh water sculpins or white sturgeons during the day I had to assume that they were the feast of choice for the Mergies. It was fascinating watching them work the shoreline in sync with each other and I’m sure that no fish had a fighting chance that got caught in their path. Again they were a little too skittish to capture a good photo so I let them alone. The next day I jumped into my float tube and kicked my way out to the deeper water which was a long ways out and tossed my assortment of dry flies with no luck. I changed over to my sink line and tried a few leach patterns. I did get a couple of strikes but missed them as they weren’t too aggressive. The couple I had talked to the day before also stated they had no luck fishing and I’m guessing it’s because of all the rain that fell for the last three weeks. Probably stirred up a lot of nutrients and Zooplankton which provide a smörgåsbord of food for trout. Went for a walk up the road a ways to a small creek that exits Klaklakama Lake and meanders towards another small lake and then to the Davie River I assume. The area where it leaves the lake was very photogenic but alas I didn’t bring my camera as my “old timers” was kicking in. This is a very pretty spot and well worth the effort for a visit to camp. If you’re coming from down Island, I recommend driving through Campbell River up to Sayward and across from there. It is only 124 km from Campbell River and pavement all the way. The only gravel road you will have to travel is the few km to the upper or lower campgrounds depending on which one you choose to stay at. If you are coming from Gold River or Muchalat Lake Campgrounds then you will want to follow the Gold River Mainline which eventually turns into the Nimpkish Mainline after a change of tree farm license areas. The traveling distance from Gold River bridge is approximately 60 kms. You will pass by the Upper Klaklakama Lake on your left before actually arriving at the Upper Klaklakama Lake Campground on Lower Klaklakama Lake. From there it is another 6 kms to the Lower Klaklakama Lake Campground. I imagine it is a popular spot during the peak summer months so make sure you have a backup in place in case you arrive and the campsites are all full. There are other options in the area like Schoen, Vernon and Woss Lake. 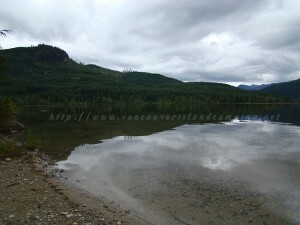 Also up the road past Woss is the Zeballos turnoff which opens up a whole other group of lakes to visit. 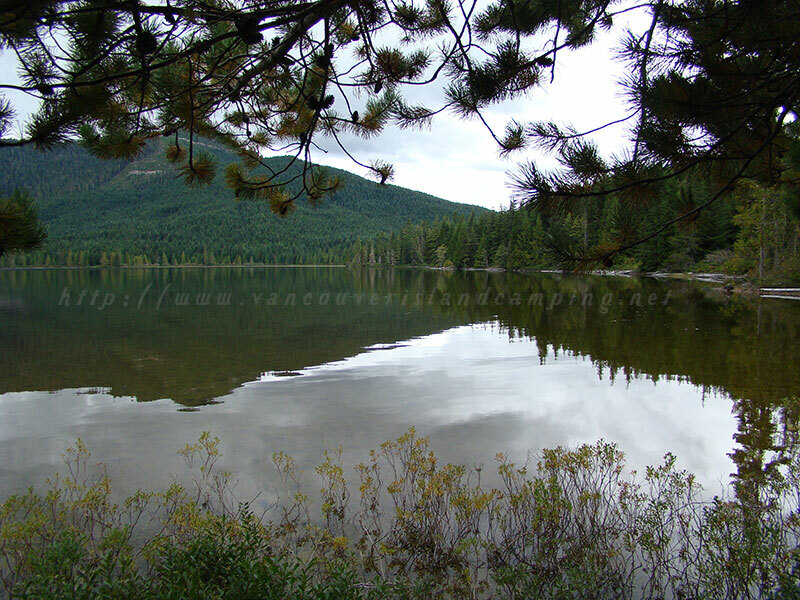 Straight across the road from the Zeballos turnoff is the way to Bonanza Lake, another very large lake that has a small recreation campground. 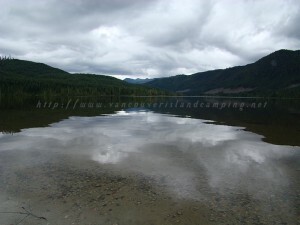 I am always amazed at the beauty of the lakes on Vancouver Island and Klaklakama is no exception. It is a very picturesque body of water with forest all around it. I highly recommend it to anyone who is looking for a peaceful get away to spend time with Mother Nature. Used to camp at Lower Klaklakama Lake many years ago when I was a logger for Canfor at Vernon Camp. Caught some big fish back then but haven’t been here in years so probably worth a trip back after reading this. Thanks for the great information and loved the video. Harold, thanks again for your comments. Definitely worth a trip back to the lake and yes there are still some big fish although not as many probably as back then. You’re welcome for the camping information and the walk through video. Hopefully you will find the time to visit the campsites on the lake sometime in the future which would more than thanks enough for me. Thanks for the informative report. What time of the year was your trip? We are planning a trip up there from down-island on May 2 for a week for fishing. Hoping that is a good time of year to fish. Keep up the good work. I’ll let you know how we make out. John, you’re very welcome. Glad you found it informative. I was there in early September of 2016. I believe as long as we have some warm weather between now and May 2, you should be alright. However, it has been a cold winter and the trout may be still a little lethargic yet. Please post back after your trip and let everyone know how you made out. Are these campgrounds first come first serve? Hi Janine, yes Klaklakama Lake campgrounds are first come, first served. The great thing is, if they are full there are very many campgrounds on other lakes in the area within 15-30 minutes of Klaklakama Lake. So there is always an option. Lakes like Schoen, Vernon, Woss, Muchalat are just a short driving distance away. Hope you have a fun time where ever you end up.